The modern-age steel business veteran, who has been a part of China's contemporary golden growth period for the past two decades, personifies something more traditional, and more akin to Confucius. While flipping through a Korean calendar, you will find a consecutive three-day holiday marked from September 18 to 20. It marks the Korean Mid-Autumn Festival, the most important holiday in Korea alongside Seollal, Korean New Year. "We will have five days off this year, including the weekend afterward,"says Kim Jae-il, former Managing Director of Posco China's Guangzhou Branch. "If I were in South Korea now, I would be joining my three other brothers and my sister, on a trip to visit my parents that day,"the 53-year-old businessman adds, "It's a tradition." Kim jokes that working overseas gives him a "decent excuse"for the absence from the family reunion back home. As he did in some of the past years, he will spend this traditional holiday with his wife and children in Guangzhou, where he started working as a Korean representative for Posco, one of the biggest steel manufacturers in the world, in 1998. Posco, a Fortune 500 company, was founded in 1968 by Park Tae-joon, a former general, in response to then South Korean President Park Chung-hee's appeal to construct an integrated steelwork, as "self-sufficiency in steel is essential to economic development,"the legendary former military ruler and father of current South Korean leader Park Geun-hye remarked during his presidency in 1960s. The tie between China and Posco, one of South Korea's most powerful chaebols like Samsung, LG and Hyundai Motor, can be traced back to the early 1980s, at the very beginning of China's opening up and reform. In the period when China could not be "self-sufficient in steel"due to the inefficiency of domestic mills and the "far from enough"supplies from Japan, China turned to its neighbor across the Yellow Sea - the Republic of Korea. In the time when China had no formal diplomatic relations with South Korea, which limited direct trade between both sides, Posco set up Posco of Asia (POA) in 1985 in then the British colony Hong Kong, via which China and South Korea made indirect steel trades until the two established official diplomatic ties on August 24, 1992. With a keen awareness of opportunities, 24-year-old Kim began his study of Chinese language at Korea University in Seoul in 1984. "I was planning to choose either French or English as a major when I enrolled in the university in 1981,"says Kim, who was born to a rural family in eastern South Korea's North Gyeongsang Province. "When I came back to the campus after three-year's army service, I changed my mind,"he continues, "after I smelled the heating up of business relations between China and my country." The confident smile on Kim's face shows that he has "no regret"about this decision, which has changed his life and kicked off his over 20-year career in the Middle East Kingdom. Following Posco's footprints in China, Kim has travelled to Hong Kong, Shanghai, Beijing and of course, Guangzhou, where he has spent over 10 years, working, studying, and living. There were only five staff members at Posco's Guangzhou office, when it was established in 1998, and Kim was one of them. Dealing with Posco's selling and trading business in Southern China, Guangzhou Posco's annual turnover exceeded five billion yuan, selling over 700 thousands tons of steel when Kim left as Managing Director at the end of 2011. Kim is very impressed by the changes that the 2010 Asian Games brought to his host city, which has fundamentally improved "both the hardware as well as the software"of Guangzhou. "The city is much cleaner and people here are nicer than ever,"Kim comments. For many Koreans the same age as Kim who grew up during the post-WWII period, the city of Guangzhou has special meaning. "Guangzhou has marked an indelible page in the history of South Korea,"he relates. "It was not only the cradle for Chinese democratic revolution, but also a place of origin for the Korean's revolution in modern history." Historical materials have recorded that some 1,000 Korean patriots emigrated to Guangzhou during the national liberation movement of Korea in 1917-1926 to escape from Japanese invaders' chase from their homeland and made Guangzhou a base for revolution. Some of them received their education from the famous Huangpu Military Academy, and relics are seen around the city in memory of Chinese and Korean cooperation in fighting against enemies. "A friend in need is a friend indeed,"Mr. Yang Chang-Soo, Consul General of South Korea in Guangzhou, was quoted as saying by a local newspaper when he talked about this segment of history between the two nations. Although he was sent to be the President of Posco-CFPC last March, a processing entity of Posco in Foshan, Kim still makes Guangzhou his home, as his family and life are based in the city. "My youngest son was born in Nanfang Hospital, and he's now attending school in Guangzhou,"shares the father of three. He also reveals that he's about to finish his doctorate study of international relationships at Sun Yat-sen University. Kim, a loyal Confucian, values social order, and believes that social harmony - the great goal of Confucianism - will bring fortune and happiness. He puts this traditional Chinese philosophy into his daily management practice. "Saying hello and goodbye to your senior when arriving and leaving the factory is essential. "Kim says, "just like what the Korean younger with their elders at home. It's a basic courtesy in traditional Korean families. "According to Kim, some 260 employees in Posco-CFPC are just like a big family and his staff are encouraged to write thanks cards to those who has offered help to him/her. "Staff is the biggest fortune for Posco,"Kim, who was named as one of the "Top Ten Professional Managers in Guangdong"in 2011, concludes, "and if a company wants to be successful, the secret is to make its staff happy. "By this theory, the Posco-CFPC must be a very happy group, as the company's annual revenue this year is expected to jump by 35 percent to four billion yuan. Looking back on his two decades of experience in China, says, "From 1990 to 2010, the country has shocked the world by an annual growth rate of double digits. I am blessed to witness the development of this amazing country,"he continues, "I hope I can continue to contribute to China, for the sustainable development and well being of the people." 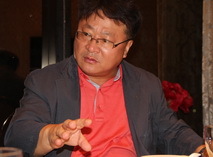 For his dedication and contribution to the province, Kim became the first and only Korean to get the Guangdong International Friendship Award on November 27, 2012.